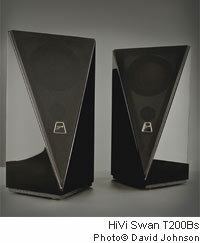 HiVi's speakers turn your computer or mobile device into a portable studio, complete with quality audio. Looking for a high-end business audio vibe without the high-end cost? Try turning your PC, iPhone or iPod into a professional-grade sound system with self-powered speakers that have their own amps and can plug directly into your computer or portable device. The HiVi Swan T200Bs come with not one but two separate amps (one for each speaker), making them essentially idiot-proof to install. And the speakers' distinct angular look adds value to even the most persnickety office design. HiVi also gets points for its nifty remote control that manages both speakers independently. For $629--less than the price of a decent notebook computer--you can add first-rate audio to your next presentation or stream music into your retail location. Sounds like a pretty good deal.